A dominant defense and a more balanced offense made for quite the spectacle, as the Cardinals opened the season with a crushing 52-21 victory over Middlebury. Despite a close first quarter, the Cardinals were unstoppable after the break and built up an insurmountable lead of 45-14 by the beginning of the fourth quarter. While the offense did a good job of converting on turnovers, it was the defense that provided the spark to drastically shift the game in Wesleyan’s favor. Both safety Ben Thaw ’20 and defensive lineman Jackson Eighmy ’21 had brilliant games, dominating the Middlebury offense with a pair of interceptions and a pair of sacks, respectively. In addition, Thaw won NESCAC Defensive Player of the Week for his dominant, shutdown performance. In the opening drive, Wes received the kickoff to start the game and started fairly well as Glenn Smith ’21 burst for a 57-yard gain. The play was called back due to a holding penalty, taking some of the momentum out of the drive. Despite gaining two first downs, the drive stalled, and the Birds were forced to punt. Middlebury’s offense clicked from the moment it got on the field, driving down the length of the field in just over two minutes to take first lead of the game 7-0. The Cardinals’ offense seemed to stutter at first when they received the ball back on offense, but thanks to a clutch third down play by Mark Piccirillo ’19 and Dario Highsmith ’20 the drive was kept alive. Following this action, Piccirillo connected to Smith for an impressive 16-yard touchdown to draw the score even at 7-7. Without missing a beat, Piccirillo and the offense seized a scoring opportunity, after a defensive stand to gain a lead they would not lose, after a slick TD pass to Joe Scancarella ’21. After two straight Panther punts, Wes started with good field position on the Middlebury 38-yard line and made decent progress on the ground but couldn’t get the final push into the endzone. They were forced to settle for a Patrick Wolff ’21 field goal to up their lead to 17-7. Once again Middlebury’s offense could not handle the stalwart Red and Black defense and were forced to punt after a short drive. David Estevez ’22 proceeded to run the ball back to the Middlebury 2-yard line before being brought down. Shortly afterwards, Sean Penney ’21 drove into the endzone for a touchdown, extending the lead to 24-7. Middlebury managed to score a touchdown with 14 seconds left on the clock, trimming the halftime lead to 24-14. 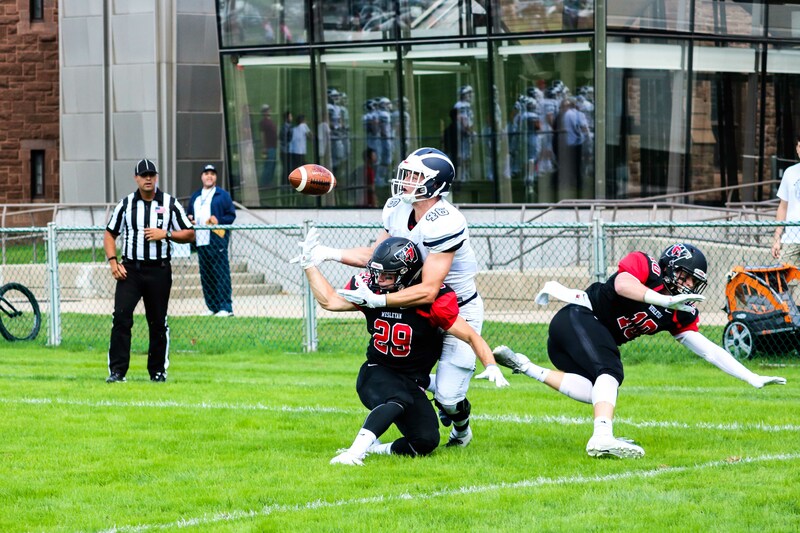 Middlebury’s hopes of preserving the momentum they gained at the close of the second quarter were dashed in less than a minute as Thaw grabbed a pick six to secure his second interception further solidify Wesleyan’s lead to be 31-14. Great plays by Highsmith and Piccirillo got the Birds back to the Middlebury red zone, where Penney scored his second touchdown of the day. After a few more Middlebury punts, Estevez carried the offense into the Middlebury redzone with a handful of strong rushes and help from Piccirillo on the ground. After some small yardage gains, Middlebury failed to find the Cardinal endzone and handed the ball over once more. Neither team did very much with the first few drives of the fourth quarter as they traded punts. On the fourth drive of the quarter, Middlebury fumbled the ball and a recovery by Will Kearney ’20 led to Wesleyan’s final touchdown to drive the scoreline to 52-14. A final touchdown by the Panthers set the ending scoreline to 52-21. With an excellent start to the season, this victory over Middlebury shows the ability of the Cardinal’s defense. Further, the offense is showing slightly more diversity than last season with a consistent running game coming from a strong collection of players. Middlebury finished second in the NESCAC last year, suggesting that this edition of Wesleyan football should contend deep into the fall. Moreover, while it was a strong performance, it was not quite perfect, and the Red and Black offense often stumbled on third down. The Cardinals head to Medford, Mass. next weekend, Sept. 22, looking to avenge last year’s close victory over Tufts. Jacques Slaughter can be reached at jslaughter@wesleyan.edu.